Laplink, which famous for its PC migration, file transfer and remote access software, is making foray into computer security business with the launch of PC Lock. PC Lock is a encryption software to help user protects personal and sensitive data from identity theft and privacy invasion in the case of stolen computers, especially laptops, notebooks and netbooks. Protects your sensitive documents with military-grade 256-bit Advanced Encryption Standard (AES) encryption. Reset your password or securely delete your data from web-based management tool for an extra layer of protection. 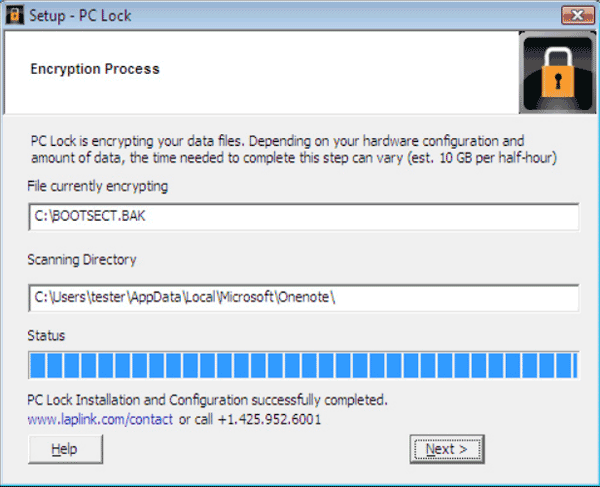 Encrypts files automatically in the background without slowing down your PC. Selectivity options allow you to control what is encrypted. PC Lock can prevent unauthorized access to your files even if your stolen computer is never again connected to the Internet. There are already many encryption software available in the competitive market, including Windows 7 built-in BitLocker and TrueCrypt. PC Lock try to outdo the rest by been unique in the sense it attempts to disable access or wipe off the encrypted data if the computer with the software is lost or stole. PC Lock stores most its security settings on web-based management console, which is also the place to report missing computer. PC Lock is having regular retail price tag of $29.95. If you’re interesting to grab PC Lock, Laplink is giving away unlimited free license with serial number for PC Lock, but just for 24 hours period on Monday, May 16, 2011. To get your own free serial number for PC Lock, head to http://www.laplink.com/pclocklaunch, and tick the check box of “Add to Cart” of PC Lock. Then, click on orange “PROCEED TO CART” at the bottom of web page. Register a new or login to existing Laplink account, and click on “Finish” button to download the free PC Lock product and serial number.